The box for this gift set is crafted from Black/Gold Leatherette, a man made material that offers the beauty and durability of leather at a fraction of the cost. Available in several colors, it features an interior foam bottom to protect and display, a velveteen lined lid, and a magnetic closure. The box holds a 6oz stainless steel flask, also wrapped in Leatherette of the same color as the box, 2 shot glasses and a funnel. 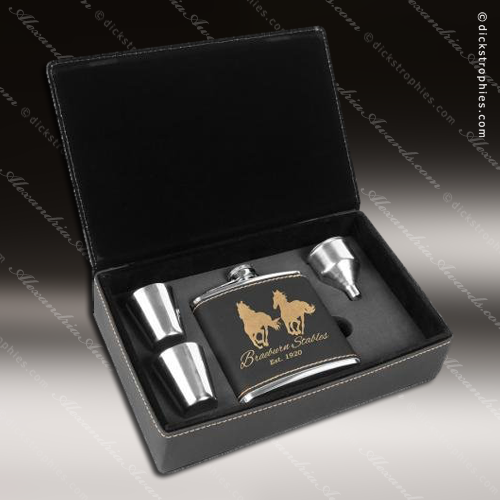 Both the box and the flask can be personalized to make this set a stunning gift, incentive, or even a memento of a special event or occasion. The box for this gift set is crafted from black/silver Leatherette, a man made material that offers the beauty and durability of leather at a fraction of the cost. Available in several colors, it features an interior foam bottom to protect and display, a velveteen lined lid, and a magnetic closure. The box holds a 6oz black stainless steel flask, 2 shot glasses and a funnel. Both the box and the flask can be personalized to make this set a stunning gift, incentive, or even a memento of a special event or occasion. The box for this gift set is crafted from black/silver Leatherette, a man made material that offers the beauty and durability of leather at a fraction of the cost. Available in several colors, it features an interior foam bottom to protect and display, a velveteen lined lid, and a magnetic closure. 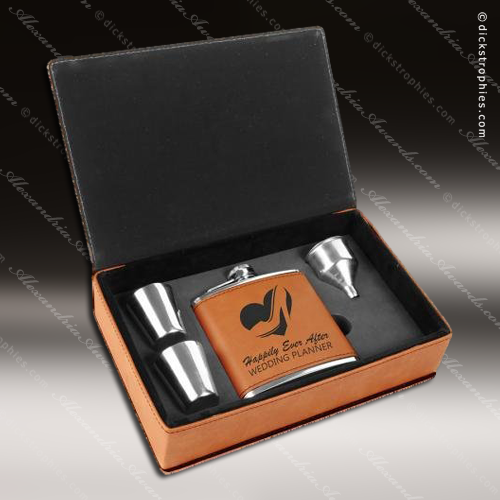 The box holds a 6oz stainless steel flask, also wrapped in Leatherette of the same color as the box, 2 shot glasses and a funnel. 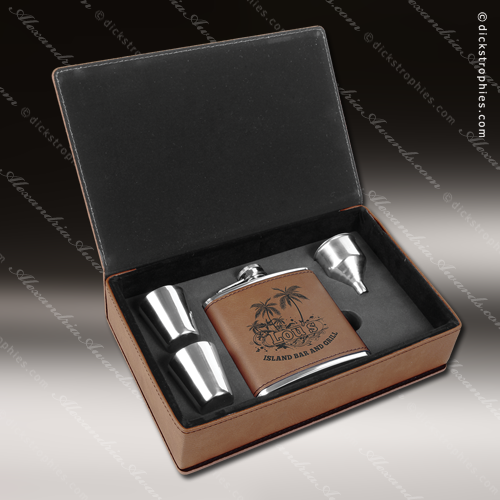 Both the box and the flask can be personalized to make this set a stunning gift, incentive, or even a memento of a special event or occasion. The box for this gift set is crafted from black/silver Leatherette, a man made material that offers the beauty and durability of leather at a fraction of the cost. Available in several colors, it features an interior foam bottom to protect and display, a velveteen lined lid, and a magnetic closure. The box holds a 6oz stainless steel flask, 2 shot glasses and a funnel. Both the box and the flask can be personalized to make this set a stunning gift, incentive, or even a memento of a special event or occasion. The box for this gift set is crafted from dark brown Leatherette, a man made material that offers the beauty and durability of leather at a fraction of the cost. Available in several colors, it features an interior foam bottom to protect and display, a velveteen lined lid, and a magnetic closure. 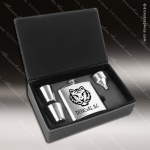 The box holds a 6oz stainless steel flask, also wrapped in Leatherette of the same color as the box, 2 shot glasses and a funnel. Both the box and the flask can be personalized to make this set a stunning gift, incentive, or even a memento of a special event or occasion. The box for this gift set is crafted from gray Leatherette, a man made material that offers the beauty and durability of leather at a fraction of the cost. Available in several colors, it features an interior foam bottom to protect and display, a velveteen lined lid, and a magnetic closure. The box holds a 6oz stainless steel flask, also wrapped in Leatherette of the same color as the box, 2 shot glasses and a funnel. Both the box and the flask can be personalized to make this set a stunning gift, incentive, or even a memento of a special event or occasion. The box for this gift set is crafted from light brown Leatherette, a man made material that offers the beauty and durability of leather at a fraction of the cost. Available in several colors, it features an interior foam bottom to protect and display, a velveteen lined lid, and a magnetic closure. The box holds a 6oz stainless steel flask, also wrapped in Leatherette of the same color as the box, 2 shot glasses and a funnel. Both the box and the flask can be personalized to make this set a stunning gift, incentive, or even a memento of a special event or occasion. The box for this gift set is crafted from pink Leatherette, a man made material that offers the beauty and durability of leather at a fraction of the cost. Available in several colors, it features an interior foam bottom to protect and display, a velveteen lined lid, and a magnetic closure. The box holds a 6oz stainless steel flask, also wrapped in Leatherette of the same color as the box, 2 shot glasses and a funnel. Both the box and the flask can be personalized to make this set a stunning gift, incentive, or even a memento of a special event or occasion. The box for this gift set is crafted from Rawhide Leatherette, a man made material that offers the beauty and durability of leather at a fraction of the cost. Available in several colors, it features an interior foam bottom to protect and display, a velveteen lined lid, and a magnetic closure. The box holds a 6oz stainless steel flask, also wrapped in Leatherette of the same color as the box, 2 shot glasses and a funnel. Both the box and the flask can be personalized to make this set a stunning gift, incentive, or even a memento of a special event or occasion. The box for this gift set is crafted from rustic/gold Leatherette, a man made material that offers the beauty and durability of leather at a fraction of the cost. Available in several colors, it features an interior foam bottom to protect and display, a velveteen lined lid, and a magnetic closure. The box holds a 6oz stainless steel flask, also wrapped in Leatherette of the same color as the box, 2 shot glasses and a funnel. Both the box and the flask can be personalized to make this set a stunning gift, incentive, or even a memento of a special event or occasion.